one open pocket and one zipper pocket for fitting plenty of bits and bobs. 22''L x 8.2''W x 10''H inches, the height of handle : 6.5 inch. 1. The zipper pulls are large,on both ends of zipper chain has made speacial processing to prevent the zipper slipping out . 2. It comes with a shoulder strap so you can carry, over the shoulder, hand or crossbody. 3. 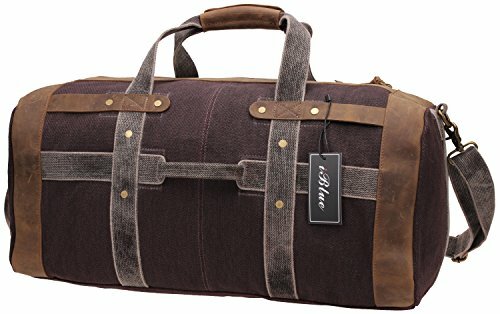 Great casual bag for many activities. Travels, sleepover or even to the gym. You can carry a lot of stuff and it should have no problem. 4. The stitching on the weekend travel luggage bag to be very strong.The hardware - zippers, connections, etc. are all very attractive and appear to be high quality. If you are not satisfy with something, please don't leave us negative or neutral feedback right away.Please contact us via email.Through the order ,you can find out : CONTACT SELLER . ✔Materials- Thick Heavy Duty Canvas, Soft Saddle Leather,Cotton Lining, Large Thick zipper, cotton woven shoulder strap, Huge Machine Pressure Cast The Hard Rivets. ✔For A 3 - 4 day trip- The Carry On Overnight Bag is 22In L X 8.2 In W X 10 In H, Would Work Great As A Carry On While Flying, On The Train, On The Bus, Or In Any Form Of Transportation. ✔Carrying Options- You can carry the canvas travel bag by four different handles; the shoulder strap, a handle on top of the bag as well as handles on each side of the bag. ✔Function- The sturdy duffle bag can be used in many scenarios,such as Gym,Yoga class,Cardio class,Taekwondo training,or fitness activity! It actually can be used as a storage bag in a vehicle,RV or even a boat. ✔Warranty- The Canvas Leather Weekend Bag Have 3-YEAR WARRANTY. Any Further Problems With Your Items, Please Feel Free To Contact Us. We Will Solve It Till Your 100% Satisfaction.